Animate CSS properties like border, background, opacity or even display or visibility. You can also set presets for animations that are used multiple times and set as many transitions as you want for each DOM element. This plugin allows you to animate 2D properties like rotation, scaleX, scaleY, x, and y. Also, you can animate 3D properties like rotationX, rotationY, rotationZ, z, perspective and transformPerspective. This works well with CSS3 animations like text-shadow, box-shadow, border-radius and clip. Whether 2D, 3D or CSS3 animations, you need not worry about adding tons of browser prefixes in order for it to work on multiple browsers. Create encrypted text effect with ScrambleText plugin, let an element follow a curved path with Bezier plugin or create physics-based effects with Physics2D plugin. Create simple to complex sliders without the bulk. Simply add and customize the plugins you need. Adjusts to any screen size so you will have an optimal viewing experience whether you are using desktop or mobile devices. This slider works on major browsers including IE9 and has no problem with Android and iOS. This plugin detects if the slider is not visible on screen and automatically pauses it. This saves a lot of resources especially for mobile devices. Prevent unnecessary load time, resources and lag by delivering the correct image size to any screen size. Take control of the slider animation with video like controls such as play, pause, seek or even jump quickly to a slide using thumbnails. Sometimes one is not enough. 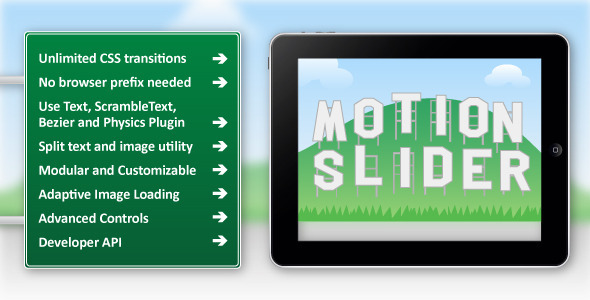 This plugin allows you to have multiple slider instances in one page. Note: It is impossible to check this plugin on every device so please check the examples in the live preview using the device you wish to support. Thanks!